The popularity of women’s football continues to grow following last year’s announcement of an updated South East Queensland Women’s football structure. Community clubs have embraced the changes across the five competitions. AFL Queensland Women’s Competition Manager, Joanna Main, said the change would continue to foster the growth of women’s football in the state. “The women’s space in Queensland is evolving rapidly and we have bene transparent with our clubs that we need to be quite agile during this period, which means ongoing change, particularly with the Gold Coast Suns joining the AFLW competition in 2020,” Main said. The biggest change in 2019 will be the introduction of the QAFLW Development League which will provide further opportunity for QAFLW clubs to develop players. In addition to providing an increased playing list, QAFLW and QAFLW Development games will both play at the same venue consecutively to allow coaches the chance to watch all listed players over the weekend. To allow for the introduction of the QAFLW Development League, QAFLW teams previously playing in the QFAW Division 1 competition will form the new competition. Bond University, who previously had no team in Division 1, will field teams in the QAFLW and QAFLW Development League this season. Aspley’s promotion to the QAFLW will also see them field teams in both semi-professional competitions this year. The restructure has also resulted in changes to the QFAW Division 1 competition. 2018 QFAW Division 2 North and South Premiers, Jindalee and Morningside, will join Division 1 alongside coast side Robina Roos. Jindalee and Robina will both continue to field a second women’s team in their respective Division 2 competitions. Two new teams, the North Shore Jets and Redcliffe Tigers, will join the QFAW Division 2 North competition in 2019, which will see it expand to a ten-team competition; making it the biggest league in South East Queensland. The QFAW Division 2 South competition will comprise of six teams this year, all of whom are returning clubs from the 2018 season. 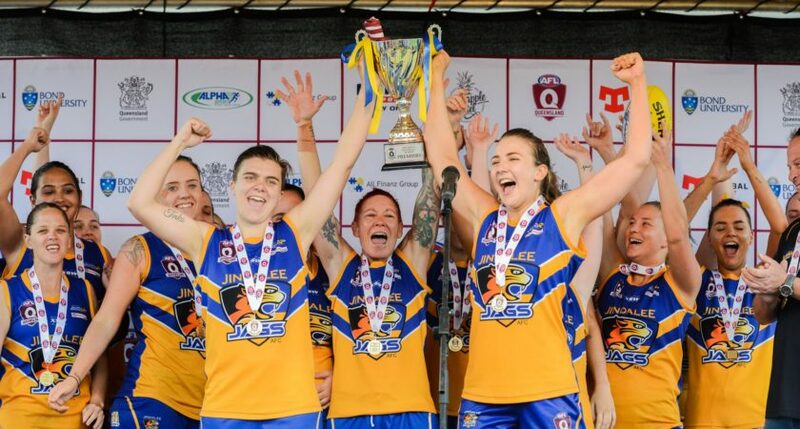 Following the restructure a name change has been introduced across the five South East Queensland senior women’s competitions, to provide consistency with AFL Queensland’s senior men’s competition and the AFLW. The 2019 QAFLW season commences April 6.